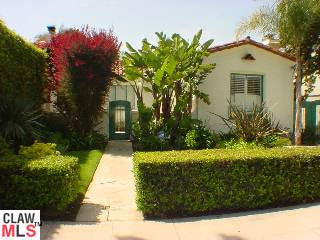 2343 Manning Ave LA CA 90064 lasted 27 days on the market before receiving an accepted offer on 12/16/09. The home was listed on 11/19/09 for $1,099,000 and didn't need any price reductions during the listing term. It closed on 1/29/2010 for $1,060,000. The last owner purchased the home in June 2008 for $1,100,000, about a 3.6% decline. According to the MLS, the home is a 3 bedroom / 2 bath, 1,791 sq ft of living space on a 6,075 sq ft lot. What I like about this Spanish home is that it has a sense of volume in it. The living area, master bedroom and den area off the kitchen all have high ceilings, helping to make this 1,700+ sq ft home feel spacious. The master bathroom was remodeled with very colorful Spanish tile, spa tub and a custom looking vanity. Additionally, the kitchen has been remodeled with newer cabinetry and stainless steel appliances. The backyard had a nice patch of grass and the garage has been converted into a bonus room.